A tribute to Terry Pratchett on Erica Verillo’s Blog, with interview and pithy quotes. Such as these. (Link http://ericaverrillo.com/1/post/2015/03/terry-well-miss-you-quips-quotes-and-courage.html) More biography and interview on Erica Verillo. The ‘nest of eggs’ great image John! Something about that painting that tugs the heart. That turtle eye! Absolutely love Faulkner’s Acceptance Speech you forwarded to me, Philippa. I’ve read it before, and it’s wonderful! It gives meaning and hope even to all the artists struggling in isolation everywhere. Private battles for the continuance of the human spirit, and one imagines the sparks flying upward and joining in some celestial dance. That man in a garret, piss-poor, drawing marks on newsprint or on the back of a cigar box, or a woman who watches over her kids and struggles to bring them up right, and on the side is working on poems or a novel: if they keep at it, their sparks too will fly upward and join in the celestial dance. 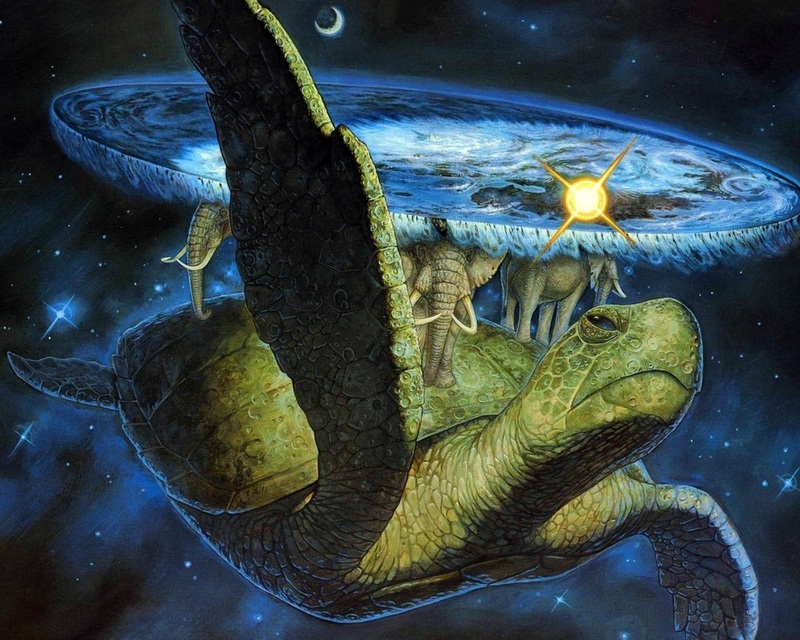 This collection of aphorisms by Pratchett is like a nest of eggs down below Mama Tortoise. I liked the turtle especially! A lovable upholder of the world, and one of my favourites is the ‘turtles all the way down’ story I had to tell in Involution! He seems to be very much a local hero, a whole shop in Wincanton devoted to nothing else! I was past children altogether and he passed me by completely, so yes, likewise, some reading to do! But from extracts he is my kind of irreverent wise fool. I also rather like a man i a large brimmed hat, always have. Must be a residual Cavalier lurking! I like Terry Pratchett’s take on the world. When his stories appeared I was engrossed with mothering my son, and doing further studies . Must catch up. Next Next post: Arthur Koestler at the Witness Box- well maybe?